There is a moratorium on natural gas drilling/fracking and water withdrawals in the Delaware River Watershed, enacted by the Delaware River Basin Commission (DRBC) in May 2010, by unanimous vote of the Commission's voting members - representatives of the Governors of Pennsylvania. New York, New Jersey and Delaware and President Obama's representative, the Army Corps of Engineers. When natural gas regulations were proposed by the DRBC with a close of public comment in April 2011, the public became engaged in a big way. Breaking all previous records for public input, 69,000 comments were submitted to the DRBC, most calling for the proposed rules to be scrapped because they were too weak and narrow and advocating for a comprehensive environmental impact analysis of what gas development would do to the Watershed and the 17 million people and almost 13,000 square miles of ecosystem that rely on the health and abundance of the Delaware River Watershed for water supply and habitat. In November 2011 the moratorium was almost lifted and the rules almost adopted but public pressure and the announcement of Gov. Markell of Delaware and the head of New York's Dept. of Environmental Conservation that they would not vote to approve the rules, caused the meeting to be cancelled and the rules to be sent back to the drawing board because there was not an assured majority to approve the lifting of the moratorium. As the DRBC continues to consider allowing drilling and fracking, the watershed health hangs precariously in the balance. Delaware Riverkeeper Network and many groups representing hundreds of thousands of members have called for a permanent ban on gas development in the Watershed since the dangerous practices involved are not compatible with maintaining and sustaining the water resources and ecosystems of the Delaware River Watershed. The environmental impacts of natural gas drilling include water quantity (on average 11 million gallons of water is used to frack each well), water quality (hydrofracking chemicals, radioactive and highly toxic wastewater, drilling muds and cuttings, waste solids and residuals that results from the well development process), stormwater runoff (nonpoint source pollution, erosion, stream degradation), habitat and ecosystem destruction and disruption, air quality (pollution from methane and other gases, VOCs and other volatile materials, silica, particulates, etc.) noise and light pollution, and community/cultural, scenic and quality of life impacts. These impacts result in direct harm to public health, especially for those where drilling and its activities are occurring. A large body of evidence is being published today of the harms to human health and the environment. Inadequate regulation of the industry at every level allows these impacts to occur, burdening communities and the environment but no matter how fracking and shale gas development is regulated, the damages are unavoidable – fracking simply cannot be made safe or sustainable. The practices required to extract natural gas are intrinsically polluting, allowing our aquifers and the environment to be permanently degraded, in violation of our environmental rights. The only way to avoid these negative impacts is to convert our energy systems away from these dirty fossil fuels and towards clean, sustainable, and renewable energy sources and energy efficiency policies. As shale gas drilling and development inches closer to encroaching on the Delaware River Watershed, public concerns are growing for the safety of water supplies, air quality, the natural environment and communities that will be affected. The 17 million people who rely on the Delaware River for water, including New York City, Philadelphia and millions of residents of New York, Pennsylvania, New Jersey and Delaware will all be directly effected if the water resources of the high quality upstream River is degraded. The practices that are used by the gas industry to extract and develop shale gas involve dangerous techniques such as hydraulic fracturing that inject chemicals--most of them hazardous, toxic and/or carcinogenic--and millions of gallons of water into each gas well. The polluted flowback or “produced water” that erupts back up is contaminated with additional pollutants from the deep geology, such as radioactive materials, and is stored on the well site until it is trucked away to a wastewater plant or injected into the deep wells (even though there are not enough facilities to handle the wastewater and earthquakes caused by the injections in Ohio and other states where many injection wells are located have caused the shut down of several, this highly toxic waste continues to be produced every day throughout the Marcellus and Utica shales). Well sites have huge well pads, usually over 5 acres, containing 6, 10, even 15 or more gas wells each; miles of roads and gas pipelines and compressor stations are begin built; and forests, farms, and rural communities are being transformed into urban, industrial conditions. Wells can even be drilled in floodplains in both NY and PA. Communities across Pennsylvania where gas drilling is charging ahead are experiencing pollution incidents, accidents, gas well blowouts, spills, leaks, and illegal dumping of toxic wastewater and produced water, water well contamination, stream degradation and ruined farms and towns. DRN invites you to join with the growing number of people who want to take action to defend our region from the degradation of shale gas drilling. We cannot sacrifice our water and environment to gas companies. Check out the supporting information below – there are links to multiple studies and reports that delve into all things fracking. Information is power and an informed public is our best defense. People and communities are organizing and fighting back and there are many ways to get involved. The Delaware Riverkeeper Network published (September 2015) a guidebook, “Defending the Environmental Rights of Pennsylvania Communities from Shale Gas Development”, to provide support and guidance to elected officials, government entities, and residents working at the municipal level to protect the environment and community resources from shale gas development. In the Delaware River Watershed in 2017, DRBC has prohibited natural gas extraction projects in the Basin since 2010 while they study its potential impacts on water resources, a de-facto moratorium that does not allow permits to be issued until natural gas regulations are adopted. The DRBC almost adopted regulations in 2011 but its voting members, the Commissioners, cancelled the meeting where the vote would have occurred amid overwhelming public opposition and that stand-off has endured to this day. However, in early 2017, the DRBC staff raised alarm bells with signals that the DRBC may be moving to adopt regulations and lift the current moratorium. The Delaware River Basin Commission’s moratorium was put in place 7 years ago by the Commission based on the determination that natural gas projects, individually or cumulatively, could have a substantial impact on the River’s water resources. As the federal-interstate agency formed in 1961 to manage the water resources of the Watershed, the Commission members – the Governors of Pennsylvania, New York, New Jersey, and Delaware and the Army Corps of Engineers for the federal government – represent the public’s interests. Chief among the Commission’s responsibilities is protecting the water supply of 17 million people, including New York City and Philadelphia. 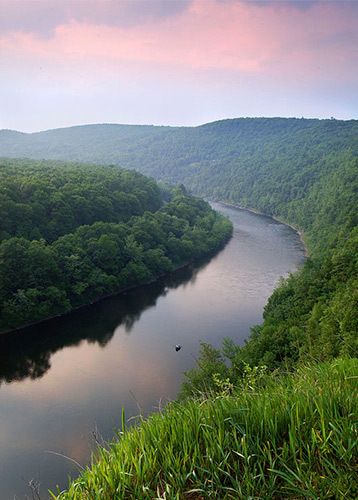 As background, the Wild and Scenic Delaware River is classified by DRBC as Special Protection Waters (SPW) due to exceptionally high water quality and outstanding natural resources with special regulations that protect those resources and maintain the River’s exceptional water quality. The entire drainage area that flows to the nontidal Delaware River, which extends from Hancock NY to Trenton NJ, is designated as SPW, and is the longest stretch of anti-degradation waters in the nation. The Commission’s mandated protection of these resources makes it impossible to allow drilling and fracking in the nontidal river protected by DRBC’s Special Protection Waters designation. When the commission enacted the moratorium three main concerns were cited – the diminishment of surface and groundwater, the release of pollution, and the impacts of frack waste disposal. In the intervening years, a substantial body of knowledge has developed containing significant evidence that shale gas development has myriad adverse effects on our air, water, and land, public health, property interests, and agriculture, effecting present and future generations. Water use for oil and gas well development and for stimulation and extraction of gas from wells is very large, particularly for hydraulic fracturing (fracking) - the predominant method used today to extract gas - which requires high volumes of water. On average, 11 million gallons of water is used to frack a shale well, a depletive use because the water is not returned to the source, most of it completely removed from the hydrologic cycle when it is injected into deep formations. Of particular concern in the Delaware River Watershed where the shale underlies the upper basins’ streams, is that the required water can remove up to 70 percent of the water in small streams, permanently depleting crucial flows, disrupting natural flow regimes and increasing damaging runoff, essentially turning some of our highest quality streams into ditches. Removal of fresh water flows also allows for the concentration of contaminants when aquifers are overdrawn, reducing base flow of streams, in turn affecting water quality and habitats. In terms of pollution potential, fracking uses toxic chemicals and hazardous materials are produced by the formations that are fractured. 1,076 chemicals are known to be used in fracking fluids, according to the U.S. Environmental Protection Agency (EPA), many of them carcinogenic, including some linked to childhood leukemia. Based on all the information that has become available about the impacts of drilling, fracking and natural gas development in the last seven years since the moratorium was enacted, the time to enact a permanent ban is now. In 2016, groups involved in keeping the Delaware River Watershed frack-free began an effort to achieve a complete ban at the DRBC. Studies reveal significant evidence that shale gas development has an adverse effect on drinking water quality, public health, property interests, agriculture and on our air, water, and land. The negative impacts of shale gas development are documented by PA Department of Environmental Protection’s accounting of 308 private water well contamination cases that were determined by the agency to have been caused by oil and gas operations through March 2018. The EPA’s newly released hydraulic fracturing study provides scientific evidence that hydraulic fracturing activities can impact drinking water resources and includes water impacts from shale gas in the Pennsylvania community of Dimock. In terms of waste production, reuse and disposal, both wastewater and solid wastes pose challenges that have not yet been resolved by government agencies or the industry. Currently, no set of federal regulations for waste produced during fracking exists except for a prohibition by EPA for the treatment of gas and oil wastewater at sewage treatment facilities. This only addresses part of the management issues and leaves some critical loopholes in place that pose environmental threats. Because of a 1988 oil and gas industry waste exemption from the Resource Conservation and Recovery Act (RCRA), oil and gas waste is not regulated as hazardous, even though it contains hazardous constituents. In fact, the shale gas industry has received unprecedented exemptions from our nation’s most important environmental and public health laws, making adequate regulation virtually impossible. Fracking produces waste that contains many of the toxics that are injected and also deep geology pollutants that are disturbed and ejected to the surface, exposing the environment and those who live in it to the increased risk of disease and adverse health effects. The radioactive isotopes that are brought to the surface can contain dangerous levels of radioactivity, requiring special monitoring and handling. Measurements by New York Department of Environmental Conservation show radium in drill cuttings from gas wells over 200 times background concentrations. Duke University scientists found Ra-226 concentrations in stream sediments at the point of discharge of a fracking wastewater facility were 200 times greater than upstream and background sediments and above radioactive waste disposal threshold regulations. After six years of exhaustive study, the State of New York prohibited fracking based on environmental and public health analysis. The NY Department of Health concluded that the overall weight of the evidence demonstrated the likelihood of the occurrence of adverse health outcomes and environmental impacts from fracking could not prevented, leading to the Governor’s decision to ban high volume high fracturing in the state. The State of Maryland permanently banned fracking after 2 years of study, based on the potential for adverse public health and environmental impacts. The Commission has not conducted a comprehensive assessment of the cumulative and long-term impacts of shale gas development that illustrates that natural gas development could safely occur within the Delaware River Basin without degradation of the Watershed’s water resources and the essential values of Special Protection Waters. In fact, the evidence supports that shale gas cannot be extracted or developed safely with current technology. A vitally important cumulative impact is the climate effects of shale development in the Watershed. Natural gas is primarily methane, a greenhouse gas 86 times more efficient at trapping heat than carbon over a 20 year time frame and its effects persist for hundreds of years. The well documented vented and fugitive losses from natural gas systems contribute to atmospheric warming; current technology and practices have not controlled these releases. EPA once thought the releases of methane from the development of natural gas were negligible – we know better today as the data has developed. EPA says 27% more methane is being leaked than previous estimates and many scientists say it’s much greater than that because of the way the gases are measured, especially when looking at the entire life cycle of fracked gas. The emissions are so great that it is projected that their release from the build out of Marcellus shale will prevent the achievement of global warming goals in Pennsylvania, accelerating climate change. In fact, nationwide the greenhouse gas emissions from natural gas production, transport and use cancel out any benefit natural gas provides despite natural gas releasing less carbon than coal or oil when it is burned. Climate change impacts on the basin’s water resources include changes in precipitation and runoff that increase flooding and drought, impairment of habitats and water quality (including salt water intrusion to Delaware Estuary water supplies) and sea level rise. Regardless of the evidence that natural gas development is not and cannot be made safe and that degradation of the environment and public health from shale gas drilling and fracking cannot be avoided, it became evident by January of 2017 seems that DRBC staff was maybe moving ahead with drilling regulations and the lifting of the moratorium. An article in Pennsylvania Digest reported that Pennsylvania DEP staff is was working with DRBC staff to develop drilling and fracking regulations. While DRBC has reported over the years that they continue to consider regulations and research the issue, there had not been public news accounts of this previously. A lawsuit brought by the industry-backed Wayne Land Management Group is attacking the jurisdiction of DRBC over gas development, raising concerns about its outcome. The new Trump Administration is rolling back environmental protections, pushing dirty fossil fuel development including domestic shale gas, and defunding and declawing agencies that protect natural resources, public lands and parks, scenic and recreational rivers. The federal agency vote on the DRBC, the Army Corps of Engineers, represents President Trump so there is mounting concern over how the new federal Administration will influence the DRBC policies and decisions, particularly gas drilling and fracking. Organizations came together in 2017, based on mounting concerns, to develop and execute a campaign to completely ban fracking once and for all in the Delaware River Watershed. 183 organizations representing many hundreds of thousands of members and the four states whose waters flow to the Delaware River submitted a letter to the Delaware River Basin Commission voting members calling for a permanent ban on fracking in the Watershed on March 15, 2017. The groups insisted that the mountains of scientific evidence, the data about water contamination from fracking, and the fracking ban in New York State and Maryland provide more than enough reason for the Commissioners to enact a ban instead. Hundreds of people have demonstrated and made public comment about the dangers and destructive impacts of gas drilling and fracking and about the public’s health and the watershed’s precious resources that must be protected from these impacts at the DRBC’s public meetings since February 2017. Each day from July 24 through 28, organizations presented petitions calling for a permanent ban on fracking in the Delaware River Watershed signed by over 65,000 people. At press conferences held for each Governor in Pennsylvania, New York, New Jersey and Delaware and the Army Corps of Engineers, the voting members of the DRBC were presented with the petitions. Click here to download the petition. At the DRBC’s public meeting Sept. 13, the DRBC Commissioners abruptly introduced and approved a resolution that could lead to a ban on fracking but is problematic in many ways. First, it directs staff to publish regulations that seek comment on “…prohibitions related to the production of natural gas utilizing horizontal drilling and hydraulic fracturing within the Basin”, which is not necessarily an absolute ban on all aspects throughout the watershed, and does not cover drilling that does not use fracking. Secondly, the staff was directed to develop regulations that could allow the “…storage, treatment, disposal and/or discharge of wastewater within the Basin associated with horizontal drilling and hydraulic fracturing for the production of natural gas where permitted” and that could allow the “…inter-basin transfer of water and wastewater for purposes of natural gas development where permitted.” The public at the meeting strongly pushed for the DRBC not to vote on the resolution as drafted and to reconsider a complete and permanent ban on all aspects of drilling and fracking and all related activities throughout the Basin. PA, NY and DE voted yes for the resolution, NJ abstained and the federal government voted no. The draft regulations were issued Nov. 30, 2017. The approved resolution is here. Read the letter the Delaware Riverkeeper Network sent to the three Governors that voted for the Sept 13, 2017 resolution regarding fracking to understand, in full, our concerns. The coalition of organizations that make up the campaign to Ban Fracking in the Delaware River Watershed have vowed to fight for a COMPLETE ban on fracking throughout the Delaware River Watershed, including a ban on frack wastewater processing and discharges and a ban on water exports to fuel fracking elsewhere. Nothing less is acceptable; it makes no sense to ban fracking but allow its toxic pollution and water depletion to ruin the Watershed. The Coalition to Ban Fracking in the Delaware River Watershed submitted a letter with DRBC for a more open and just process for commenting on the draft regulations and proposed ban. The comment period was set to close February 28, far too short, and one a few hearings, all in Pennsylvania, were set. The groups demanded more public input opportunities and changes to the difficult process that DRBC set for how to submit comments – the agency wouldn’t even allow written comments to be submitted by email, fax or regular U.S. Postal Service mail. See the letter here. Groups also attended the DRBC’s December public meeting to deliver the message that fair and accessible public input into this all-important rulemaking was essential and must be provided to protect the watershed and to provide a just process. As a result, the public comment period was extended to march 30, 2018 and 3 more public hearing opportunities were provided – but they were still all in Pennsylvania and one was only on the telephone. Throughout the public comment period, the Coalition to Ban Fracking in the Delaware River Watershed worked to ensure as much input from the public as possible, given the constraints of the difficult to navigate comment process and the time of year. Delaware Riverkeeper Network produced and hosted several webinars on the draft regulations and shared information from experts and reports to help people prepare for the Public Hearings so they could confidently testify verbally and to write informed comments through the written comment process. From the beginning of February through to the close of public comment on March 30, the Coalition to Ban Fracking in the Delaware River Watershed provided different suggested comments and background information on various aspects of the draft natural gas regulations and proposed frack ban through easy-to-use on-line platforms that submit your comments directly to DRBC – Watershed Wednesdays and 8 Weeks to a Ban (see Supporting information below). The goal was to encourage lots of public input to explain why a COMPLETE ban on fracking and its activities in the Delaware River Watershed is required. National environmental organizations, anti-fracking groups, community organizations, and residents together submitted at least 40,000 comments to the Delaware River Basin Commission (DRBC) in support of a full ban on fracking and all drilling-related activities, including wastewater treatment and water withdrawals by March 30. Counting late submissions, over 60,000 comments were submitted. The Coalition also submitted a letter signed by 126 groups, representing millions of members of the organizations represented, making the same demand. Unfortunately, DRBC issued a press release stating it received less than 9,000 comments. The discrepancy is due to the fact that the DRBC counted thousands of individual comments submitted by members of organizations as a single comment, severely diminishing the widespread support across the region, and the country, for a full ban and denigrating the value of those who took the time to comment. See the press release on this issue here. Municipalities throughout the Delaware River watershed have been adopting resolutions In support of s COMPLETE frack ban over the last several months. Many of those resolutions, now numbering about 20, were submitted to DRBC during the public comment period and some were submitted prior and after the formal comment period. Townships, boroughs, cities and counties continue to consider resolutions and many are moving draft resolutions through their process with a goal of influencing the final decision of the DRBC Commissioners. DRBC has announced that they expect to vote on the draft regulations and proposed ban by the end of 2018. Organizations continue to attend DRBC meetings, submit information and relevant documents to DRBC regarding fracking and its activities and publicly address the pressing issues of frack wastewater pollution, water depletion by fracking, and the devastating impacts of drilling and fracking. Hansen, L., Habicht, S., and Faeth, P., CNA, “Potential Environmental Impacts of Full-development of the Marcellus Shale in Pennsylvania”, September 2016, p. 35. Environmental Protection Agency (EPA). 2015. Assessment of the Potential Impacts of Hydraulic Fracturing for Oil and Gas on Drinking Water Resources – External Review Draft. June 2015. Available at: www.epa.gov/hfstudy; Hein 2012, p. 2. Deziel, N. et al, Yale School of Public Health, Journal of Exposure Science and Environmental and Epidemiology, January 2016. Concerned Health Professionals of New York and Physicians for Social Responsibility, “Compendium of Scientific, Medical, And Media Findings Demonstrating Risks And Harms Of Fracking (Unconventional Gas And Oil Extraction)”, Fourth Edition, November 17, 2016. Oil and Gas operations are exempt from portions of major federal environmental laws including: Clean Air Act; Clean Water Act; Safe Drinking Water Act; Resource Conservation and Recovery Act, Comprehensive Environmental Response, Compensation and Liability Act (the Superfund Law); and Emergency Planning and Community Right-to-Know Act. Amy Mall, et. al., Natural Resources Defense Council, Drilling Down, October 2001, p.iv. NYSDEC, Division of Environmental Remediation, August 2012, re. Allied Landfill, Niagara County. Warner, NR, et al, “Impacts of Shale Gas Wastewater Disposal on Water Quality in Western Pennsylvania,” Enviro Science and Technology, Oct 2, 2013, pp. 11849. Intergovernmental Panel on Climate Change (IPCC). 2013. Climate Change 2013: The Physical Science Basis. Contribution of Working Group I to the Fifth Assessment Report of the Intergovernmental Panel on Climate Change. PSE Healthy Energy, “Lifecycle Greenhouse Gas Emissions Associated with Projected Future Marcellus Development”, 2017. Watch our webinars to learn what the draft rules say and the proposed ban could mean.